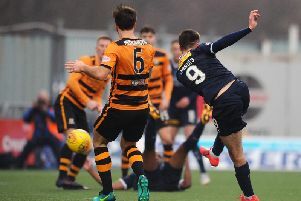 Falkirk manager Ray McKinnon has come under criticism from a section of the Falkirk support in the wake of his side's 2-1 home reverse at the hands of Alloa Athletic, with claims the team has been set-up negatively. McKinnon has opted for a formation which sees Zak Rudden as the team's focal point - although that changed at half-time on Saturday as Aaron Jarvis came off the bench to join the on-loan Rangers man up top. 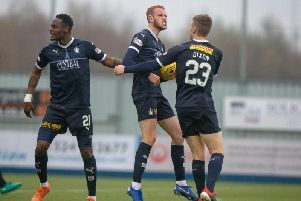 When asked about some fans being unhappy with the team being set-up not to lose rather than win, McKinnon responded: "We set up on Saturday with two strikers - Demmy (Petravicius) and Zak (Rudden) with Waddington. We play a three in midfield and it has been very successful for us. "We felt that, because of certain aspects of the game on Saturday, we wanted to change it and we got an instant reaction. "But that shape has been the one that has pulled us right back into it so we need to be mindful of that and not be reactive to one game. That 433 has been fantastic for us - because that is what we have, we are not blessed with out and out wingers and strikers so that shape has done really, really well. "Whether we change it going into the last four games remains to be seen but we have never ever, ever, gone out to be negative - we have gone out to win games and that is why we have done so well since the turn of the year." Aaron Jarvis, as said, was the man that came on to change the shape - and McKinnon had praise for the youngster, on loan from Luton Town, who has had to remain patient. "It has taken him a bit of time and the team has done well, and the shape has done well, so he has had to be patient and come on. He did well down at Queen of the South as well, and up at Ross County so it's good to have that option to bring him on or start him."